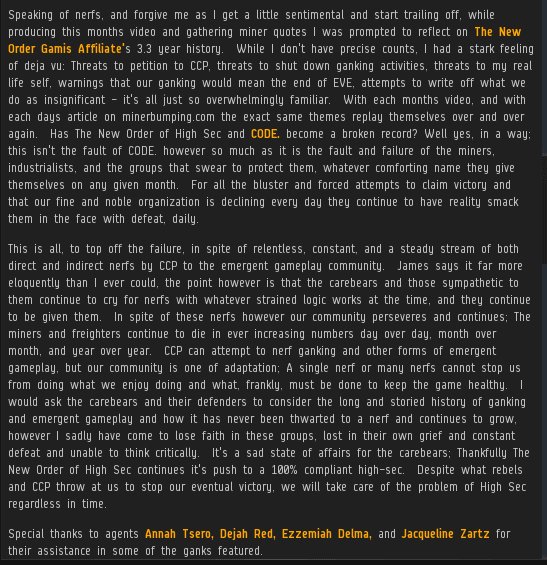 Nullsec has seen a handful of really big, really memorable battles--battles of the kind that will be remembered for as long as the game itself. They're rare. In highsec, thanks to the New Order, such battles are much more common. Agent Kalorned and the Gamis family have been in countless elite PvP combat actions. Because they take place in the name of the Code, they're instantly and permanently relevant, even years later. That's why we're so eager to watch them, regardless of what year they took place. You see, compiling the video put our Agent in a deeply reflective mood. When that happens, highsec takes notice! As always, each and every edition of the Code Is Forever series can be found via links on our appropriately titled Links page. loyalanon? 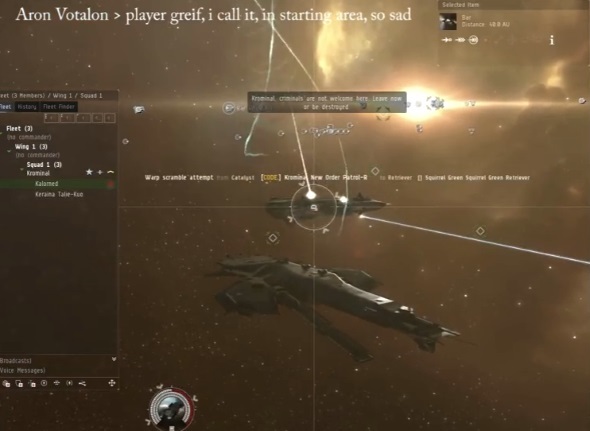 He's still the #1 PvPer in EVE history, despite being banned for some time now. The Player behind loyal? Idk, prolly training up the blaster skills on his most recent character. Bahahahahaha I hope he's training up his next toons to get them banned for the trifecta. Eagerly awaiting the daily delivery of highsec PHag salt. Don't let me down you H.O.M.O.s! Agent Kalorned is a Titan of the New Order. He's been producing these showpieces for quite a while now, and they never fail to satisfy. Long may they continue! The Code, they say, is Forever! Agreed, Agent K is a rockstar. Kalorned what Video capture program do you use? Shadowplay is great because it's also simple to use and it builds compression directly into the recording. The same 30 second video from above usually ends up no larger than 200MB. There are drawbacks however, shadowplay doesn't differentiate between your desktop and your eve client when in windowed mode, so everything gets captured and has to be subsequently edited out (you can see this effect in the latest Self Defense in Gamis, the black bars along the top and bottom are me covering the desktop). Finally, more of an annoyance, but when you start recording an overlay "You have begun recording" or some such flashes up and stays for a good 5-10 seconds before going away, you have to begin recording pretty far in advance to dodge it from showing up on the material you want to use. I use shadowplay now just because of the disk space savings - With fraps I had a 1TB hard drive and I was hitting my cap regularly, requiring me to go back and manually compress everything after the fact which was annoying. If Fraps wasn't dead development wise and had built in compression I would love to keep using it.